Hand hygiene is something that our mothers usually nagged us about but is it really that important? Well yes, it is one of the most important things we can do to prevent the spread of disease. In fact after vaccination it is probably the next most important public health weapon we have. Washing hands properly will help prevent the spread of diarrheal illnesses caused by bugs like e.coli, salmonella and C. dff but also respiratory infections like colds and 'flu. Any attempt at washing hands is useful but hand hygiene is more effective if the steps outlined in the pictures below are followed. Why is this method better than just doing what comes naturally? Scientists have found that when they swab people who have washed their hands in a more adhoc fashion, bacteria and viruses can hide in the nooks and crannies around our hands, like the crevices between our fingers and the little dip in the palm of our hands. The method outlined below, for which credit is given to the World Health Organization, leaves no stone unturned and covers nearly all the places that bugs can hide. Dirt and bacteria can also hide under our nails so it is also a good idea to pay attention to this area by cleaning under our nails with a tool if they need it, before washing our hands and preferably under running water. Do not wash hands in a sink full of water as you will recontaminate them. If you are worried about wasting water then turn off the tap during the lathering phase. It has been shown that this only minimally raises the risk of recontamination. Ordinary bar soap is just as effective as liquid soap but liquid soap can be bought in non-touch dispensers. These can be useful if you handle a lot of raw meat and don't have anybody to dispense the soap for you. I often get summoned to the kitchen to pump the soap but then it is the least I can do when I am having my dinner cooked for me! Or you can use your elbow to dispense the soap. Follow these hand washing tips and you will have much cleaner hands than if you just wash your hands using no particular plan. Use these steps a few times and you will quickly remember to cover all places where the bugs have been found to hide! You should wash your hands for between 40-60 seconds. An easy way to time this, is to hum or sing the song 'Happy Birthday To You' twice. I think I have got most of the people I know doing this now! This seems like a lot of hand washing but if you wash your hands on these occasions you will be practising good hand hygiene. Limit yourself to times like this though, as you do not want to remove the friendly bacteria which live in the deeper layers of our skin and help to protect us. If we over-do our hand washing we also remove the helpful friendly bacteria that we come across in our everyday lives. So yes, our children should play in the park and get dirty the way we did when we were young but if they visit Granny in the hospital then make sure they wash their hands before and afterwards as that is where most of the nasty bugs are lurking. 1. Ordinary soap is just as effective as antibacterial hand washes. Questions about health implications and antibiotic resistance from the use of certain ingredients like triclosan in antibacterial hand washes is currently being investigated. 2. Using just water and rubbing is almost as effective as using soap because it is the friction, the dilution and rinsing off of the bugs which helps the most. 3. 80% of all communicable diseases are passed on via touch. 4. You are more likely to catch a cold from touching something than from someone sneezing near you. 5. You will have more bugs on your dominant hand but you will wash your non-dominant hand more effectively! 6. Women are more likely to wash their hands after a visit to the bathroom than men (75% v 50%). 7. The highest levels of bacteria and viruses are on the finger tips. 8. The temperature of the water does not matter but cool water will cause less irritation. 9. Dry skin means the bugs find it harder to survive, so drying is very important. 10. 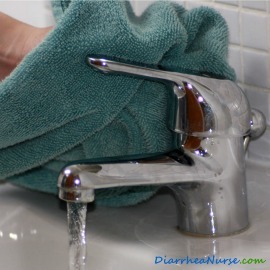 Fabric towels can harbor large numbers of bacteria, so change frequently. 11. Effective hand hygiene reduces absenteeism from work and school and improves productivity. 12. It is estimated that if everybody followed good hand hygiene practices the number of deaths associated with diarrhea could be reduced by 50%. 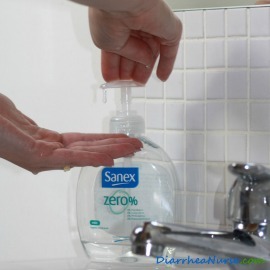 Does Alcohol Sanitizer Gel Provide Effective Hand Hygiene? Alcohol hand sanitizer gel plays an important part in effective hand hygiene when people are busy or do not have access to washing facilities. Use hand sanitizer gel only when there is no visible dirt. Use the same application technique as the hand washing technique described above. Continue rubbing until your hands are dry. This type of alcohol hand rub has been shown to reduce the transmission of infections in schools, hospitals and other public buildings where large groups of people gather. Please note, however, that hand sanitizer gel cannot completely replace hand washing as it is ineffective against some infections. It kills almost all bacteria and fungi but only some viruses and it does not affect spores. For example the spores of C. diff are unaffected by it. Other gels that do not contain alcohol have now been invented but you should look for ones which have persistent activity or residual activity. So, in other words they are not just short term. Other problems with these non-alcohol hand sanitizers are that they can become contaminated themselves and some contain ingredients which have been associated with antibiotic resistance. By all means use the alcohol hand rub but if possible wash your hands. Educating children about good hand hygiene is very important as you are not only protecting them and other people but you are setting good habits which will go on to help them for the rest of their lives. 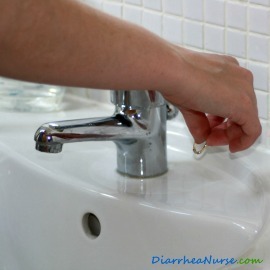 DiarrheaNurse hopes this information about how to wash hands has been useful. This website is all about diarrhea in its many forms. One of the primary ways of stopping the spread of infectious diarrhea is to practice good hand hygiene. If you wash your hands effectively when you visit the bathroom, prepare food and visit people in hospital you will not only protect yourself but you will be performing a public service. You will be helping to protect other people in our society who are more vulnerable than we are, like children, the sick and the elderly. For more information about E.coli, beating C. diff infection, causes of diarrhea, diarrhea symptoms and diarrhea treatment﻿ please browse the site.